Carbon Sports GmbH has received the CE report of conformity from the German Lloyd (DNV-GL). 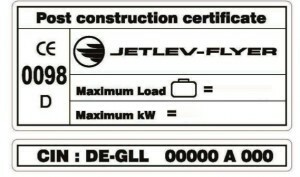 This document is the European certification that certifies the JETLEV-FLYER on a continental and international level. With the CE approval the JETLEV-FLYER is classified as a sports boat of category D.
This allows all JETLEV-FLYER users and pilots to fly the JETLEV-FLYER everywhere where it is allowed to operate. The declaration of conformity was granted by the authorities in northern Germany and ensures international standards in the construction of the device. The JETLEV-FLYER has been assessed with respect to the conformity procedure described in Article 8 clause 1 of Council Directive 94/25/EC on Recreational Craft as amended by Directive 2003/44/EC and found to ensure equivalent conformity with the applicable requirements. The institution responsible for the certification of the JETLEV-FLYER was the “Germanischer Lloyd” from the northern German city of Hamburg. This institution is in charge of reviewing of all class-relevant design documentation, calculations and drawings, they check that the design is approved, they do testing and certification of materials and equipment, monitoring the shipbuilding and they conduct regular visits to the fleet. Carbon Sports GmbH was waiting for this declaration of conformity for several years and the challenge in this certification was mainly the uniqueness and innovativeness of the product. Due to the fact that the JETLEV-FLYER is the first of its kind and no other similar devices exist, the challenging part was to classify it within a specific kind of product.